With rich industrial knowledge and expertise, we are actively engaged in offering a wide range of Correction Fluid AQ.15 ML. Our offered fluid is processed using fine grade raw material and latest machines and tools. We are engrossed in providing to our honored customers a quality range of Correction Fluid Pens. These products are made by our accomplished vendors who use the industry permitted input advanced technique. Also, we provide these products at low rate to our clients. As one of the foremost traders in the market, we offer high quality correction fluid used as ink erasers. This quick drying and hassle free fluid is best for offices, corporate sector, schools and colleges. We offer our range of correction fluid in unbreakable and spill resistant bottles with attached brush for safety and security. 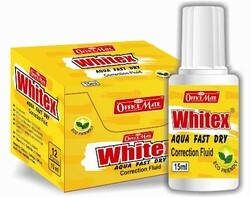 We are the leading and prominent Trader, Importer and Exporter of Correction Fluid. We are an acclaimed name indulged in offering our patrons a superior quality range of Eraz Ex Fluid. ZESTA CORRECTION FLUID is a special masking fluid used for correction written/typed matter.